Corset Myths | Who Were They? Hollywood has not helped fashion historians and enthusiasts, what with its misinformation about clothing in the 19th century. Heck, about clothing in just about any century, but that is beside the point. With the popularity of the Western movie genre in the mid 20th century, quite a lot of incorrect information became accepted as fact, especially concerning women’s clothing. In this day of unlimited information available, you would think facts would thrive and myths fall by the wayside, but in reality the opposite seems to occur quite frequently. I love “top ten” lists and follow several sites that publish these types of lists. Every single list having to do with the 19th century invariably includes some inaccurate factlet about corsets. As a history buff, reenactor, historical clothing enthusiast and seamstress, it drives me nuts. So, I feel it my job – nay my duty to my forebears – to correct some of this myth with actual fact. In no particular order, I give you…. They were an “optional” garment for women to wear. This could not be further from the truth. Women’s dresses were structured to give the wearer a particular shape or silhouette, according to the latest fashion plates. This could not be accomplished completely through boning of the dress. Foundation garments such as the corset were necessary to shape the woman’s body into the desired figure. The corset also helped distribute the weight of heavy skirts across the torso. “Progressive” women did not wear a corset. The phrase “loose woman” comes from a woman who isn’t wearing a corset under her clothing. For a moment, consider the female anatomy and you can probably guess what happens when a woman doesn’t wear a corset, bra, or any other sort of restraining undergarment. They looked….loose. It was extrapolated that the only kind of woman who wouldn’t wear a corset was a woman who wanted to draw attention the the accessibility of her body. Which leads us to…..
Prostitutes lounged around in their corset and drawers while waiting for customers. It is known and documented that prostitutes wore similar clothing to other women: dresses. The scantily clad woman in drawers and corset is a Hollywood device and not much more. They were laced all the way closed (tight laced). A study of women’s corsets was undertaken in 1887 which asked 52 women about their corset lacing habit. The average laced their corset with a 2″ to 2 1/2″ gap in the back, with some respondents indicating they preferred up to a 4″ gap. The full study is here. The article was written by an obstetrician and it reads like a medical paper, so be warned. Certainly, some women laced themselves tightly, but for the most part the average woman just wanted to be laced to a comfortable degree. Women had ribs removed to achieve the desired hourglass figure. Considering that medicine advanced more during the American Civil War than it had in the previous 200 years, this is a frightening proposition. If the patient survived a horrendous operation to remove a bone from the rib cage – quite possibly a full chest crack and use of a bone saw – she was likely to succumb to infection. Penicillin was not discovered until 1928 and “modern” antibiotics were not in use until 1935. That hourglass figure is most likely the result of tight lacing for an advertising artist and just like today was an exaggeration of the idealized figure. The corset was invented in the 19th century for women. The earliest corsets have been documented as Roman garments that bound the body into a desired shape. Structured garments similar to the corset have been around since before the time of Queen Elizabeth I, having been introduced by Catherine De Medici to the French court in the 1500s. In the 1830s, dandies – men who dressed in the first stare of fashion – used corsets to nip in their waist and create the illusion of broad shoulders. During the 19th century the corset had many different shapes and styles, each designed to achieve a certain look and they continued to be available for men and women throughout the century. Indeed, corsets continued to be worn into the 20th century. They were uncomfortable. An undergarment is as uncomfortable as you allow it to be. I’m certain every female reader has had an uncomfortable bra at some point of her life. And she threw it away. This is the case with corsets. A woman didn’t have one corset that lasted her entire life. Depending on her economic station, she had different types of corsets for different purposes. Some were less rigid, probably made with cording, and used for working or “at home” time. Corsets for a ball gown were designed slightly differently than corsets for everyday wear. Bottom line, the corset served several purposes and would have been one of the most comfortable pieces of clothing a woman would wear, not the least comfortable. We can’t judge this garment with our modern opinions. They are made of light satin and plastic bones. Alternately, they are made of heavy coutil and whalebone. The surviving corsets available to us for study are likely fancy ones tucked away in a trunk along with a treasured dress, or similar scenario. So, we don’t have “everyday” corsets to study, only these fancy ones. It sounds absurd to us to think that in 125 years the general public will believe all women of the 2010s wore Victoria’s Secret underwire padded push up bras, but this is the thinking applied to extant Victorian corsets. And, just to stop the madness, that polyester satin “corset” you picked up at Frederick’s isn’t a true corset in the sense that I am using the word. It doesn’t shape your body and it isn’t strong enough to spread the weight of clothing across your entire torso. They are difficult to make. Well, I would say that making a corset is intimidating, but in reality if you can sew a straight line, you can make a corset. A typical Victorian style corset is made with several layers of cotton coutil, cut into narrow strips, fit to the body, sewn together, and a number of bones are inserted. In addition, there is a busk in the front (the rigid hook & eye piece) and grommets in the back. Doing all this work is time consuming (about 12 hours worth), and if you make a mistake it’s a pain to backtrack and rip seams. If your measurements are wrong, your corset could be too big or too small. So, it’s not difficult but it requires attention to detail and concentration. I made one for myself. I have purchased all subsequent ones custom made, heh. They were worn outside the clothing. This is a 20th century trend that has women wearing bustle dresses, but with their corset on the outside of the bodice (think steampunk here). A Victorian woman would no more wear her corset on the outside of her dress than a modern woman would wear her bra on top of her silk blouse! Certainly, making a corset is a great accomplishment and some of them are very lovely, but they were undergarments, emphasis on the under. There was a type of belt, called a Swiss Waist or corselet, which was worn on top of a blouse and skirt, but a regular corset was also worn underneath. The corselet was just decorative and only lightly boned so it wouldn’t wrinkle. Pingback: Myths about corsets | Who Were They? Thank you for helping to put these myths to rest. I knew about all these categories already. Some of the myths are laughable, if believed. The public in general needs to use common sense on what us true it not. Thanks again; great article! I cringe every time I hear/read “Oh she must have had a rib removed!” As if! Actually, it may have been rare, but it’s factual and historically documented. Informative and fascinating. Fine post. Thanks. I’m always disturbed by how modern actresses when portraying period women in tight corsets, manage to move so athletically. The Sherlock Holmes series for instance, makes motion seem easy, but I think it must have been very challenging in the Victorian era. What years should we use for the era of corseted women? Some of the women in the 1860’s do not appear to be wearing the same kind of constraint as those of the 1880s, and women in 1910 sometimes look like they have artificially compacted figures. To answer your question about the years, a corset of some form or fashion was considered the correct undergarment from the 1500s to the early 1900s. You are correct that the corset did change over time and that did change the way women looked. The 1860s look was cylindrical where the 1900s look was an S-shape. I have seen corset ads as late as the 1930s, although by that time they were using more flexible materials in their construction. Indeed, the girdle – which women wore all the way into the 70s and still wear in the form of Spanxx – is an evolution of a corset. As to your comment about modern actresses moving so well in corsets – they are likely not wearing a corset of the era they are portraying. Costume for theater is wonderful for achieving the look of an era without duplicating the full construction of clothing for said era. What actually made movement challenging in certain parts of the 19th century was the shoulder seams of dresses! For quite a while, the seams were dropped off the shoulder and placed across the upper arm. This makes it awfully difficult to raise your arms, giving rise to the “southern belle” who can’t do more than raise her hand for you to kiss, lol. She literally could not reach above her own heart. Indeed, it was the rise of interest in athletic activities, such as bike riding and tennis, that helped women break away from the more restrictive corsets and clothing of the past. On the advertisement I used on my home page, some of the corsets are detailed as “summer weight” which would be much more cool and allow better air flow. 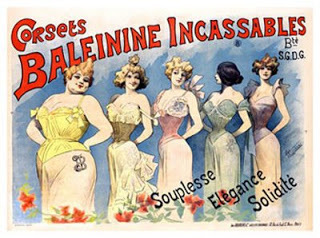 I have also seen advertisements for exercise corsets for men and women from the later 19th century, about 1880 and 1890. Wow! That was exceptionally informative. I believed basically all the myths. I’ve seen it so many times in movies and art that I just believed the hype. I also loved your insight into the history of the term “loose woman”, thats hilarious. This is NOT a myth. When we were in Ireland we went to the Strokestown Park museum and they talked about the woman of the house having had a rib removed so she could have a smaller waist. The surgery was done in the late 1800’s. This is what I wrote on a similar post of myths of corset wearing in reply to another comment about the utter myth that ribs were removed in the 19th century. I know a man who did have a rib removed for one of those reasons 12 years ago. He was months recovering and was confined to bed for a very long time. He had 24 hour care for many months with the wound area being constantly monitored for any risk of infection. He was much weaker physically than he had been before. If a person before the 20th century had a rib removed it is likely they would have died. Anaesthesia was only discovered in the mid part of the period and was not controllable enough for the rest of the century to be of use in an major operation like this would be. If anaesthesia was not used, the pain alone would send the patient into severe shock and probably fatal shock, let alone the serious risk of loss of blood and subsequent infection setting in. I doubt any woman would have been insane enough to have asked for this procedure….if they had, they may have found themselves in an insane asylum. Many women and men found themselves there for less. Well, I would suggest you take that up with the people at Strokestown Park. Seriously. As both my husband and I remember it, they said that there were records of the procedure being done. I’m sure they would be open to an email about it. All I’m doing is repeating what we were told were facts. This is the woman in question. I have been in museums and heard absolute falsehoods purported to be fact. Unfortunately, some legends attain a life of their own. I suspect in the example you gave, it is not true. I have contacted the museum with no response, unfortunately. A million thank you-s for writing this!! As a corset wearer, enthusiast and professional corset maker for more than 20 years I’ve heard all of these misconceptions and more. Good common sense tells us all of the things you’ve stated, but people prefer sensational “facts” to the more mundane truth. Would you consider publishing a little booklet with this information? With the upsurge in interest in corsets there’s more misinformation than ever floating around. Thank you again for writing this! !